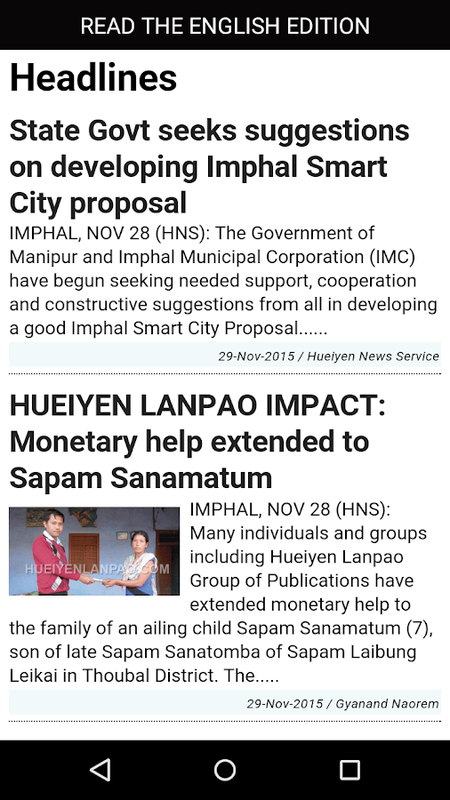 Hueiyen Lanpao mobile application is about manipur news and allowsyou to view the entire news of the web site on mobile device veryeasily. You can select different editions like English, Manipuriand Meitei Mayek, navigate through the pages of the manipuri andmeitei mayek news papers and it was never such easy. Also viewingand reading news paper becomes much easier with this application.Sync once in a day and offline support. Meitei Mayek Tutor is a simple application for beginners whichteaches you the original manipuri alphabets. You can touch on thescreen and scroll left and right to go through the tutorials.It hasgot four chapters the Mayek, Cheitap, Lonsum and Mashing. Thisapplication just serves as a startup learning material.Pleaseprovide you valuable comments so that the application can beimproved.FOR MORE INFORMATION ABOUT LEARNING MEITEI MAYEK PLEASEREFER TO www.e-pao.netNote: Targeted mainly for small screendevices but the next versions will be included for larger screentoo. Poknapham mobile application allows you to view the entire news ofthe web site on mobile device very easily. You can navigate throughthe pages of the Poknapham and The Peoples Chronicle news papers.Itwas never such easy to read e-paper with the pages shown on theleft to navigate easily. Also viewing an archive e-news paperbecomes much easier with this application.Highlights:Read news fromPoknapham website very easilyRead news from The People's Chroniclewebsite very easilyRead e-paper news from Poknapham very easilywith navigation to different pages done very well.Read e-paper newsfrom The People's Chronicle very easily with navigation todifferent pages done very well.Going back and reading a archivede-paper was never so easy.Please do provide comments, feedback sothat we can improve to server you better.Note: The applicationworks best in good internet as of now, please provide us yourconcerns and we will try to improve it. 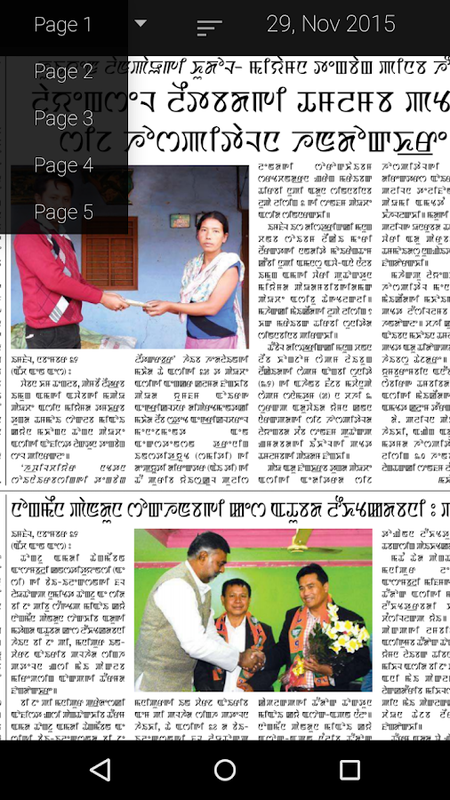 E-pao mobile is a small application which shows manipuri news andinformation provided by e-pao mobile site. All the news andinformation are provided by e-pao and the application merelydirects to the news links. The application is useful as e-pao newsreader does not have to type in or bookmark the link anymore andcan just click on the icon to start reading. Any news item andinformation can be shared easily using this application through anymessaging platform. ISTV youtube news channel has also beenincluded in this application so that user can easily view the newsupdates.A about page of the application is also included from wherea user can also easily share the application to any other users. Incase of any issues and feedback please do write in the comments andkindly rate the application if you find it useful. A next generation mobile application from activeschools(http://activeschools.in/) which shows all the information ofschools to the administrators, teachers, parents and students.Ateacher can take attendance directly using the mobile applicationwhich gets synchronized to the server. A teacher can also view allthe relevant timetable, academic calendar etc.A administrator canperform operations to broadcast messages to all groups of theschool such as the teacher group, student group, admin group, nonteaching staff and students group.A parent can login and check allthe information of the schools as well as the performance , remarks, marks of particular student/child.They can also see all the examschedules of the student so that they can monitor their ward moreclosely. A parent can also send messages directly to school orclass teacher.A student can login and view the current homeworksand the marks he gets and the performance, remarks for improvement.Study materials and tutorials are also available which helpsstudents in improving their academic work. E-pao feeds app makes you to focus on the important updates, itshows news of manipur and latest updates provided by e-pao feeds.All the news and information are provided by e-pao and theapplication merely directs to the news links and present it in aeasy to navigate way. The application is useful as the app focusesonly on the most recent updates. 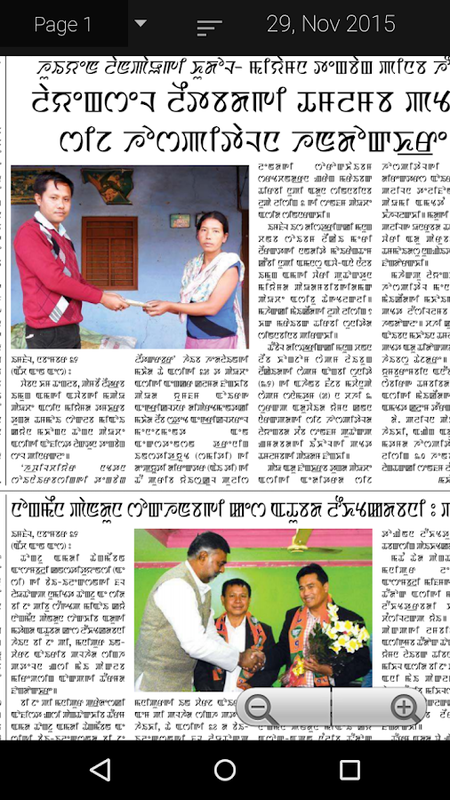 It shows the latest manipur job,manipur sports news, Manipur press releases, editorial,announcements, gallery, academic education , hotspot and many otherannouncements. Some highlights:Latest HeadlinesNews SnippetsJobPostingsGalleryEducation AnnouncementsHotspotDisclaimer:The entirenews feeds and update is from epao and the authenticity andcopyright is maintained by epao. The application just tries topresent the information in a better way for the end users to read. Manipur Voter List app shows you the list of Manipur voter listdepending on the selected districts and election areas. The Manipurvoter list can be viewed easily if your device has already a pdfviewer app installed otherwise it will just download the list ofmanipur voter list on your phone as a pdf. The list can be viewedeither as a english version or as a manipuri version.The app alsoallows you to search for a particular voter by providing certaininputs like the name and the province. Disclaimer:All theinformation in this app is provided by the Chief Electoral Officerof Manipur and the app merely redirects to those information foreasy access to the public of Manipur. The app holds no responsiblefor any wrong information provided here as the information isdirectly from Chief Electoral Officer of Manipur. All the leading newspapers of Manipur in one singleapp.Disclaimer:The information contained on this app is for generalinformation purposes only.It is just guide to the user. Allinformation is collected from internet and the ownership remainswith the news publishers. The app merely redirects to the originalnews sites.Our Priority goal is providing best user experiencewhile news reading. Manipur News Corner lists all the Manipuri news sites includingManipuri News Papers and can set one as default so that theparticular news site can be read every time the app launches.Inaddition to it the app can show the headlines as a single image orfew text sentences for each new sites and manipuri news papers. Itcan also push notification for manipuri breaking news andinformative articles. All the contents from the news sites aremaintained by the site owners and the app merely shows descriptiveinformation from those.Few of the feature highlights are asbelow:User can view highlights as a image or as few textsUser canset a particular news site as a default and read it every time theapp launchesReceive breaking news and updates as notificationSharea article directly from the appRead detail information about adescriptive notificationListen to All India Radio Imphal (AIRImphal) news. This is the first ever and the only online Radio streamingapplication for All India Radio , AIR Imphal, Manipur, a localRadio channel. You can listen to radio program any time of the dayeven if you missed something. Radio programs are also available inmultiple languages of both the hills and the valley ofManipur/Kangleipak including Hmar, Paite, Kabui, Thadou, MaoTangkhul and Manipuri languages. Feel the presence of Manipurwherever you are, wherever you go. It translates Manipuri words in Bangali Script into correspondingEnglish meaning and Vice - Versa. 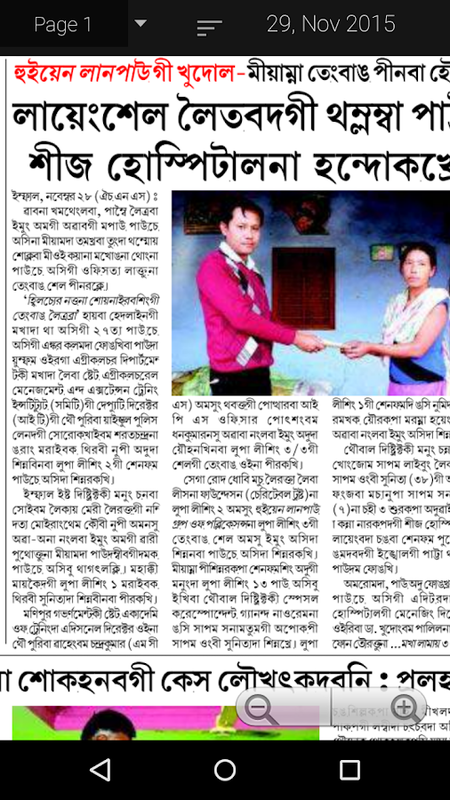 This is free version developed byNIELIT Imphal under the sponsorship of DST, Govt., of Manipur. This is the official Application of Cyber Crime Police StationManipur, which intends to help the citizens of Manipur in filingand tracking complaints with just few steps. Manipuri lunar calendar for 2017-2019. It is just like traditionalManipuri calendar. Features:- 1. Easy to use. 2. Both Meitei mayekand Bangali script. 3. Festivals. 4. Info about Tatnaba, Thasimaikei. 5. Horoscope (Rashi). 6. Holiday List. Please provide usthe feedback and ratings to keep us supported on playstore andserve you better. Manipuri lunar calendar 2017 - 2019 is a simple calendar (TrialVersion). Just click on the button to view months, tatnaba, thasimaikei, holiday etc with meitei mayek script. It is easy to use andsupport android version 2.3 and up.